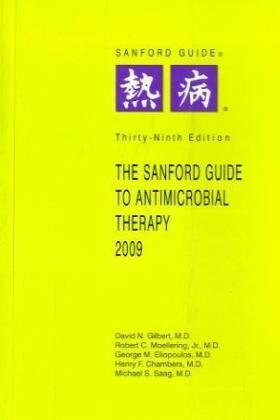 With bioterrorism, avian flu, and drug-resistant infections in the news, doctors need a guide to antimicrobial therapy more than ever.The Sanford Guide to Antimicrobial Therapycontinues to be one of the most frequently used and widely relied upon references in medicine. 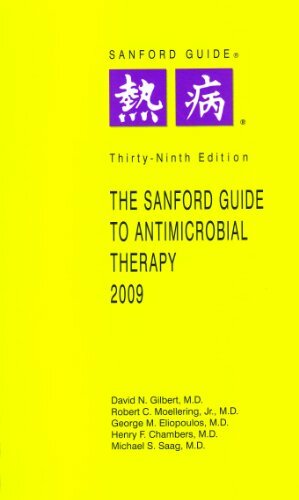 With ever-increasing challenges posed by new and re-emerging infectious diseases, this concise, well-annotated pocket reference remains a staple in lab coat pockets throughout the world. New material found in this edition includes updated recommendations for management of community-associated MRSA, treatment options for highly resistant bacteria, and current regimens for antiretroviral therapy. All of the tables have been updated to reflect newly approved drugs, new indications for existing drugs and updated dosage, side effects and pharmacologic data. 5. 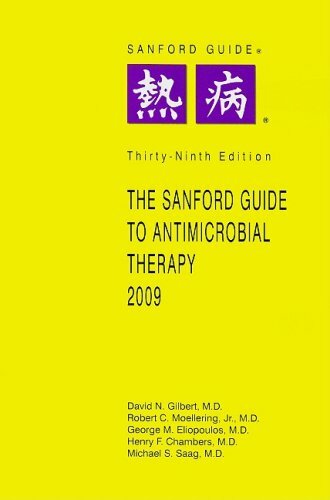 Sanford Guide to Antimicrobial Therapy, 2009 [Apr 01, 2009] Gilbert, David N., M.D. ; Moellering, Robert C., Jr., M.D. ; Eliopoulos, George M.; Chambers, Henry F., M.D. and Saag, Michael S., M.D.